Are you wondering where to buy Crocs for kids? 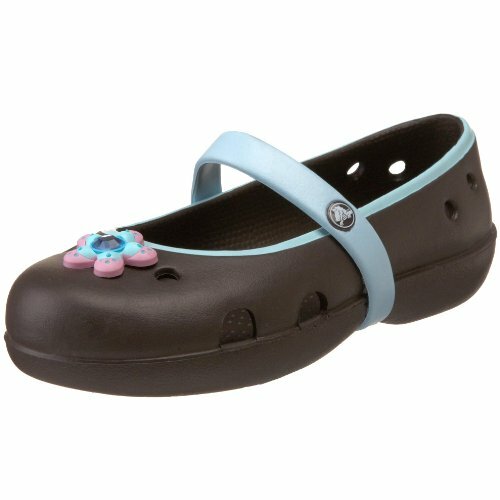 I've just researched and bought new crocs for my toddler and preschooler and thought I'd share my experience. Why I like Crocs for Kids. What did kids wear on their feet in the summer before Crocs came along? I think Crocs are great for the summer because they are lightweight and comfy with lots of holes to keep little feet cool. I always flinch when I see little kids wearing open-toed sandals. My kids are always tripping up and walking into things. Covered toes are much better. But sneakers are too warm on a summer's day. Most of the Crocs styles keep kids toes covered. Crocs are easy for kids to get on and off too which is brilliant when they keep wanting to move between the garden and the house every five minutes like mine do! They make great beach shoes too. Crocs with socks? Yeah, kids can get away with it! Socks are handy if you need to move up to the next size but they're still a little loose. And also if you're not quite sure what the weather will do and for extra warmth at the end of the day when the kids have come out of the sea. 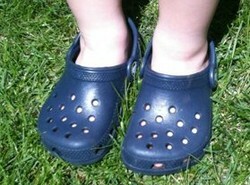 My toddler son tries his new Cayman Crocs out in the garden. One of the reasons for getting him Crocs is that we're about to start potty training. Crocs were brilliant for potty training his brother - very easy to rinse under the faucet after any accidents! I needed Crocs for my two boys for an early summer holiday. 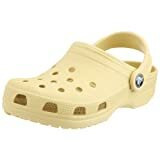 Amazon had a good selection of the Classic Cayman Crocs with free shipping over $25. The prices vary considerably depending on the color and style (from $13.95 - $34.99 at time of writing) but most are under $25 so you'll need to buy a small something extra to get free delivery. Since it's not hard to find something you need on Amazon (sun hat, sunglasses?) this isn't too much of a problem. I couldn't beat Amazon's prices and was prepared to be flexible about choice of color to get a lower price. At lot of other places had comparable prices but charge for delivery. I like buying from Amazon as their return handling is great if there is ever a problem. The prices vary a lot so you'll save money if you can be flexible on the style and color. Last year my younger son got yellow Crocs (his favorite color) and this year we went with Navy as they were good value and easily match lots of outfits. My preschooler son loves red and is very happy with his Pulse Red Crocs. The Classic Cayman Sandals are great for the garden and beach. But Crocs have brought out loads of new styles of Crocs for everyday wear. I've picked out my favorite girls style (the Keeley Mary Jane) which comes in lots of different colors and designs (not just pink!) It's practical and cute. 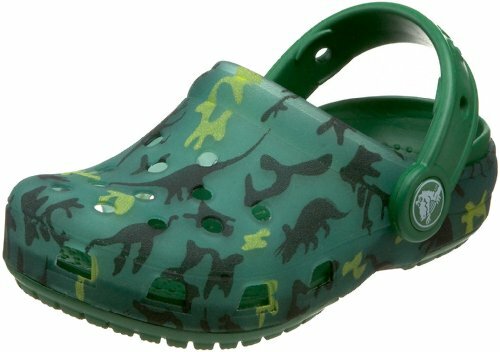 And favorite boys style (the Clog Dino Camo.) Practical and great fun for kids who love dinosaurs. It also comes in a choice of colors. Is it worth trying cheap Croc copies? One summer we tried some cheap Crocs from a supermarket. Big mistake. My son was complaining about sore feet within 30 minutes and wouldn't wear them again. They weren't as soft or light as proper Crocs. I'm sure the copies will keep getting better, but we're going to stick to proper Crocs rather than buying cheap copies and then having to buy real Crocs as well because the copies aren't any good. Proper Crocs also last well. Next year my younger son should be able to wear his big brother's old Crocs. They're in good condition so should certainly last another child. If you have boys and girls you might want to consider neutral colors so they can be worn by more than one child. It's also worth checking for kids Crocs on eBay. You might find a bargain. Crocs last pretty well so you might find a used pair with plenty of wear left in them if you are on a tight budget. My kids are living in Crocs outside school now the weather is finally improving! My younger son got a hand me down pair from his older brother, they're still in great condition although they were worn all summer. My older son got a new pair of red crocs (he still loves red!) Amazon had the best price again this year. And yes, potty training the younger one was successful - his blue Crocs did get rinsed under the faucet a few times! Not just for kids. My husband is a Crocs fanatic! He has every style of croc for men ever created. Even his dress shoes are Crocs! They actually look very nice.